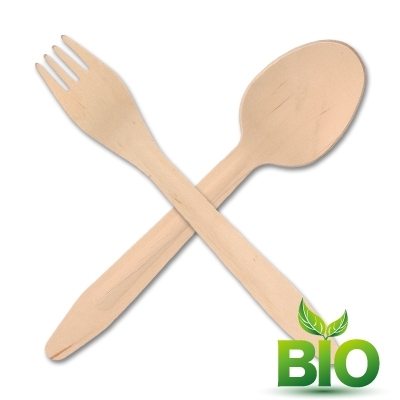 Cutlery made from wood or the bioplastic CPLA will put an environmetally friendly smile on your face! The wooden knives, forks, spoons and other wooden utensils are FSC certified by the manufacturer. The FSC-certificate of the Forest Stewardship Council indicates that the wood is derived from a forest that is independently assessed as a well-managed forest according to environmental, sustainable, social and economic standards. CPLA is a bioplastic that can not be distinguished from traditional plastic. The sturdy CPLA cutlery is a Bio-Logical replacement for traditional plastic cutlery!